Scary Monsters (and Super Creeps) is the fourteenth studio album by David Bowie, released in September 1980 by RCA Records. It was his final studio album for the label and his first following the so-called Berlin Trilogy of Low, “Heroes” and Lodger (1977–79). Though considered very significant in artistic terms, the trilogy had proved less successful commercially. 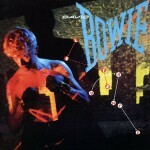 With Scary Monsters, however, Bowie achieved what biographer David Buckley called “the perfect balance”; as well as earning critical acclaim, the album peaked at No. 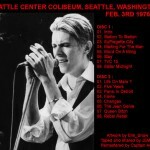 1 in the UK and restored Bowie’s commercial standing in the US. The album has been rereleased four times to date on CD, the first being in 1984 by RCA, the second in 1992 by Rykodisc (containing four bonus tracks), the third in 1999 by EMI (featuring 24-bit digitally-remastered sound and no bonus tracks) and the last in 2003 by EMI as a SACD (Super Audio Compact Disc). Bowie returns to New York to start work on Scary Monsters album at New York’s Power Station. After two and a half weeks only It’s No Game No.2 was entirely complete. 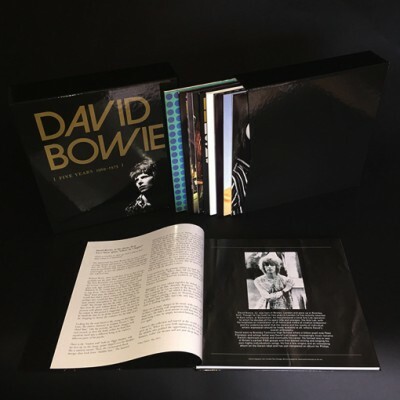 The rest of the tracks were left as instrumental and shelved until Bowie had a chance to revisit them with fresh ideas for lyrics. Also recorded during the sessions was Crystal Japan, intended to close the album before the It’s No Game No.2 reprise took its place. The album was completed in London at Visconti’s Good Earth Studios. The LP marked the return to a more conventional style of writing as Tony Visconti had witnessed. Final production touches in London. 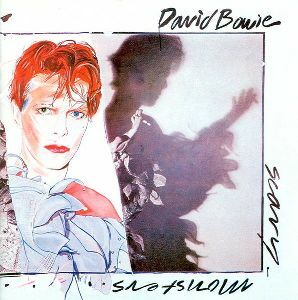 The sleeve, commissioned by Bowie, began with a photo session with photographer/designer Duffy (who designed the iconic Aladdin Sane sleeve) which he took to Edward Bell who developed the sleeve design using cut outs of old Bowie album sleeves, whitewashing them to symbolise the discarding of Bowie’s old personae. Bowie was sufficiently pleased with the result that he commissioned Bell for a further portrait from the session which was included on the cover of the 1982 Bowie calendar and entitled Glamour. David came to me and said he wanted a Pierrot look, and he let me design from there. Most of the time I draw up some ideas and then work with the subject around those. The preparation for David’s make-up took one and a half hours. The clown costume was designed by Natasha Kornilof, friendly with Bowie since his days with Lindsay Kemp. She also designed the white sailor’s outfit Bowie wore on the 1978 world tour. 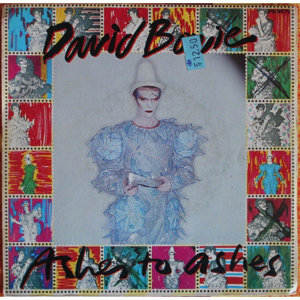 Ashes to Ashes / Move On single was released in three different covers, the first 100,000 copies containing one of a series of four sheets of nine stamps, designed by Bowie. “Ashes to Ashes” was the lead single from the 1980 album Scary Monsters (And Super Creeps) and became Bowie’s second UK No. 1 single. It is also known for its innovative video, directed by Bowie and David Mallet, which at the time was the most expensive music video ever made. “Fashion” was released as the second single from the album and was accompanied, like its predecessor “Ashes to Ashes”, by a highly regarded music video. Promo LP issued in the US featuring the complete Scary Monsters LP and Space Oddity (1979 version) (RCA DJLI-3829A). After the Brian Eno-assisted trilogy of Low, “Heroes” and Lodger, 1980’s Scary Monsters proved David Bowie could survive without the former’s studious ingenuity while retaining a futurist brief and injecting a more essentially rock’n’pop brief, which paid off greater commercial dividends. 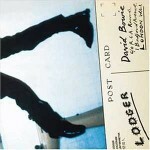 A more confrontational, audacious set than Lodger, the success rate is constant – ‘It’s No Game’’s jarring, visceral rock, ‘Up The Hill Backwards’ off-kilter poppiness, the title track’s helter-skeltery spin, ‘Ashes To Ashes’ divine dream-pop melancholy (and David Bowie’s second Number 1) and ‘Fashion’s merciless funk riffing. Throughout, Bowie is in superb voice, and lyrically candid and increasingly politicised to boot. The drawback is the extra tracks-only one is new, a surprisingly mild and frankly unfunky restoration of ‘Panic In Detroit’ from 1979, although the instrumental prettiness of the 1980 Japanese-only single ‘Crystal Japan’ makes for a tranquil conclusion.